Interior lighting is really a mixture of science and art. There is a real skill in getting the lighting just right in a room and creating the right balance of utility and beauty. It’s something that our team has studied a lot about, even getting certified by Lightolier and the American Lighting Association. This helps our team provide the customers in our Houston showroom with the best advice about their interior lights. We love learning more about your lighting challenges and helping you find the perfect solution. Our dedication to finding the perfect balance in the art and science of great lighting is what keeps our customers coming back to us again and again. For over 55 years, we’ve seen some incredible lighting design along with some absolute disasters. We’ve really seen it all in lighting design, but we’ve taken notes on the great ideas and learned from others mistakes. 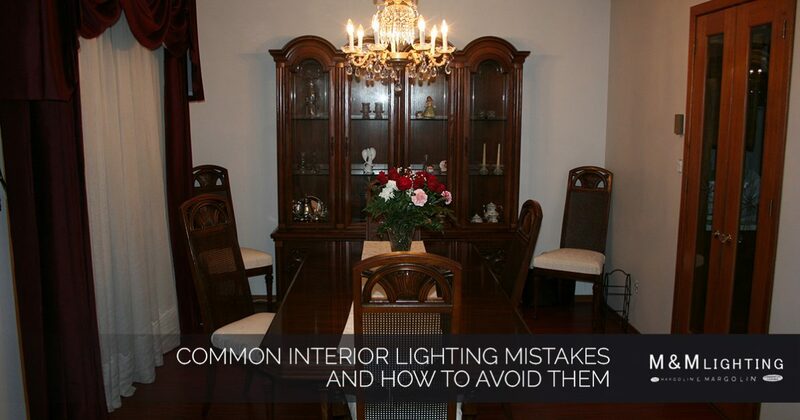 Here are some of the most common mistakes we’ve seen in interior lighting design and how you can avoid making them in your home. Are You Making These Common Lighting Mistakes in Your Home? Using too much recessed lighting. There is a time and a place for recessed lighting. They are great when you need a big wash of light in a space, especially along a wall, or if your ceilings are too low to make a traditional pendant light functional. There are a lot of benefits to recessed lighting, too, including the fact that they provide lighting without much of a visual impact, giving you a clean look without clutter. But a lot of builders and designers have a tendency to depend on recessed lighting far too much. Recessed lighting should not be used as task lighting; that’s better left to table lamps and other lighting fixtures that shine directly on the work surface. You should also avoid using recessed lighting in vaulted or cathedral ceilings. You’ll be paying to light up a lot of space high up and not actually shining any light in the areas that you are actually using. Not laying your lighting in your space. There are basically three types of lighting: ambient, task, and accent. When you are designing the lighting for a room, you need to think about all three of them. Your ambient lighting is the overall illumination of the space. That might include ceiling fixtures and the natural light that’s coming in from the windows. Accent lighting is the lighting that’s used to create an atmosphere in the room. It might be a table lamp or a spotlight on a piece of artwork. Task lighting is the light you need in order to get things done. In a kitchen, this might be the light over your countertops, or in an office, it could be the lighting on your desk. Failing to think about all three layers of lighting is going to result in a room that looks unfinished and doesn’t provide you with the light that you need. Not considering how the light will create shadows. Where there is light, there are shadows. There is a good chance that there are going to be shadows somewhere in your room; if there isn’t, you have the lights turns up way too bright. But you need to be strategic about where those shadows are falling. To do this, you have to carefully consider both the placement of the lighting fixtures and how you are using the space. For instance, if you need task lighting in your sewing room, an overhead light behind you isn’t going to do much good. That’s because your body will block the lighting from reaching the area where you are working. The bathroom is another good example. If you use only a pendant light in your bathroom, you’ll struggle with tasks like putting on your makeup and shaving because there is only downlighting. You also need lighting shining at eye level to property illuminate your face and give you the light with which you need to work. Sconces and lighted mirrors will solve this problem. Choosing fixtures that are the wrong size. You’ll need to choose a fixture that’s the right size for the room and the design aesthetic. If you choose something that’s too small, it can end up disappearing in the decor and looking bland. If you choose something that’s too big, it will be tough to notice anything else in the room. There is no formula to finding the right balance, though. It’s going to depend on your decor, the layout of your room, the height of your ceiling and the purpose of the lighting in the space. Some decor designs might call for a slightly larger fixture in order to create a centerpiece for the room. If you aren’t sure, it’s often better to err on the side of the old saying “bigger is better,” but speaking to a lighting designer in our showroom may help you find exactly what you need. Not loving the fixtures that you choose. At the end of the day, it’s your space. You need to love it. If you fall in love with a fixture that might not follow these rules, it’s okay to still use it! You should be excited and delighted by the lighting in your home. If you find something that’s not quite right, talk to our team. They may be able to come up with an alternate that you love just as much or help you create a lighting plan that incorporates the fixture you love into the perfect design. There are so many amazing, gorgeous, and phenomenal fixtures out there that there is no reason you should be stuck with something boring just because it’s supposed to work in your space. Choose the fixture that you love and we’ll help you figure out the rest! If you are looking for a trusted lighting partner in the Houston area, M&M Lighting is ready to help. We have been working with clients in the Houston area for over 50 years, helping homeowners and builders create gorgeous lighting designs for every room in their homes or offices. Our team stays up-to-date on the latest lighting trends and innovations so we can help our customers create something they are proud to turn on. Come see everything we have to offer in our Houston lighting showroom! We’re located off of the junction of Interstate 610 and 69, making us an easy destination from anywhere in the Houston area. Our team would love to give you a tour of our showroom and tell you more about how we can help you create and implement the perfect lighting design.